Construction: Yellow Brass with Gold Brass Bell. 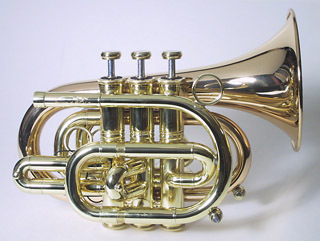 The Carol Brass CPT-300LR is the “third generation” pocket trumpet produced by the Hoxon Gakki corporation of Taiwan. Their earlier pocket trumpets have been sold in the US and Europe under names including Pocket Max, LA Sax, Fasch and (I believe) Phaeton. This earlier Hoxon pocket model most closely resembles the Benge pocket trumpet. The Benge was first produced in the mid-1960s, and has remained the “gold standard” by which other pocket trumpets are judged. A professional grade trumpet, the Benge retails in the neighborhood of $1600, which, while not inexpensive, is less than some other maker’s pocket models. In this respect, it has established the “bar” for affordable, yet professional pocket trumpets. I have owned one of the LA Sax models for some time and regard it as an above-average player, to the extent that I keep it in my trunk as my primary gig backup instrument. With that in mind, my expectations for the Carol were quite high. I compared the Carol Brass Pocket Trumpet against the earlier Hoxon/LA Sax pocket and a 1975 Los Angeles Benge pocket. Please note that the (Hoxon) LA Sax is identical to the currently-sold Colin Pocket Max. While a full-size bell doesn’t guarantee a good-sounding pocket trumpet, in my experience it can make a big difference. The Benge’s bell diameter is 4.7 inches (120mm) in diameter, which is duplicated by both Carol and LA Sax (note: Carol also offers the model CPT-300SR, with a smaller 3.7 inch/93mm bell). Hoxon chose to make the Carol’s bell in gold brass which has a slightly higher copper content that the more typical yellow brass. While subtle in appearance, the bell is the most noteworthy aesthetic feature of the Carol. The Benge and LA Sax share a fold-back style third valve slide, a design feature found on other quality pockets such as Calicchio. 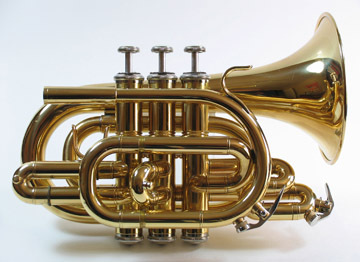 The Carol employs a wide-crook style third slide that runs alongside the valve block, similar to the vast majority of pocket trumpets, including the ubiquitous Jupiter. There is nothing new here – Distin pocket cornets used a similar arrangement starting in the 1870’s. As with the Jupiter, this slide as a thumb ring soldered inside the crook, to make it function as a third slide throw. This is not the best design mechanically, as wide-crook slides have to be perfectly aligned to move smoothly. However, the slide on my Carol does move smoothly – although if you move it too far, the shorter of the inner tubes will pop out. It should be noted that neither my LA Sax nor my Benge have any third slide adjustment whatsoever (I have seen Benge pockets with a third slide ring, although the practicality of such an arrangement is questionable due to the ring being virtually inaccessible). One of the things I like best about the Carol is that they chose to use a conventional “straight-back” first slide design (same as Benge and LA Sax), instead of the “fold-forward” design seen on the Jupiter and a host of other pockets. This can have benefits in making the instrument easier to hold by not cluttering up the valve block with slide tubing, and also makes it easy to add a thumb saddle or ring to provide first slide throw. Both LA Benge and LA Sax have first slide saddles, both of which are easier to access. On the Carol you either have to reach through the third slide ring and use the tip of your left thumb, or somehow use your right thumb. Neither work well. Personally, I’d have opted for a modified third slide, not adjustable, instead opting for better access to the first slide ring. One note of caution: since the first slide does work so easily, if you have the bell pointed up and happen to depress the first valve, the first slide will most likely drop right off of the horn (I tested this). The simple solution is to tie a loose loop of elastic cord (from the sewing store) through the slide and around nearby fixed tubing. Overall, the fit and finish is very good, although not quite to the standard set by Benge. The lacquer is nicely done. Hoxon limited the Carol trademark name to the mouthpiece receiver only, leaving the bell un-engraved, which I consider very tasteful. The Carol features heavy mass valve caps, and while currently in vogue, I personally don’t think they make a difference. The Carol uses Amado-style water keys, which are not my preference -- although these seem to work very well and are reasonably accessible. Earlier Hoxon models used conventional water keys of very good quality. From a manufacturer’s point of view, it’s easy to see why they have gone in this direction, as Amado-style water keys are much easier to install on the horn. One complaint I hear quite often with pocket trumpets, is that they are hard to hold. The Carol is, at least for my grasp, an improvement over most other pockets. My first impression of the case was that it appeared to be cheap. I generally prefer a more classic style case, and that’s what Hoxon has made in the past. I also thought it seemed large – an important consideration when travel size is a primary reason to buy a pocket trumpet in the first place. Upon closer examination, however, I realized that, while plastic, the case was actually of very nice quality ABS material, with clever side latches, and a spring loaded handle that causes it to fold flat when not in use. The interior is form-molded foam with plush covering and highly protective, to the extent that these trumpets can be shipped by simply putting the case into a same-size corrugated carton with no additional packing material necessary. Barring severe crush damage, there’s almost no way to harm the trumpet in this carrying case. As for my perception of the case’s size, I compared it to the 70’s Benge pocket case, and found that it was only slightly larger. Still, the Carol case interior provides a small compartment to one end (presumably for valve oil or extra mouthpiece, since it’s far too small for mutes), which could have been eliminated altogether and the length of the case could have been reduced to 12” or so. While the more traditional cases made by Hoxon for LA Sax (and others) are more to my taste, I have noticed that they are not the sturdiest, and can appear shabby with some use. I think this new ABS shell may be a more durable and practical design in practice. Hoxon’s valves are very good, although they use a somewhat stronger (more resistant) spring than is my preference. Benge’s valves were typically very light and fast and are certainly one of the best features of instruments made in LA. The Carol’s valves feel just the same as the much earlier LA Sax – very good, but as mentioned, a bit stiff. All three trumpets have the same .459 bore (11.7mm). Since I’m really a cornet player, I tried all three using my usual choice, an old model (the design was changed recently) Yamaha 7D4d short shank cornet mouthpiece utilizing a generic cornet-to-trumpet adapter. Comparing the playability of trumpets is very subjective, and I am nowhere near an accomplished technical player (I play jazz standards exclusively). But I can comment on general feel and playability. Going from one horn to the next, I found very little, if any, difference between the LA Sax and the Carol, either in terms of openness, flexibility, or tone. Going to the Benge, I found the tone to be somewhat darker, and more immediate than the Carol. The tone of both Hoxon horns seemed identical to each other, both being brighter than the Benge, with more projection, which could be of benefit in some gig situation. Obviously, the choice of mouthpiece can and will make a great deal of difference in tonal quality in all three trumpets. As stated earlier, the Benge has long been the standard for how a professional pocket trumpet can play. My example exemplifies that. However, my LA Sax gives it a real run for the money, being very open-blowing and flexible. And since the Carol plays essentially like the LA Sax, it presents an equal challenge to the Benge as well. I recently played the Carol Brass Pocket Trumpet for two sets at a gig, and found it perfectly suitable for a professional jazz setting, as I expected it would be based on several “at home” sessions. Generally speaking, a new Benge pocket, or an older, used Los Angeles example, will cost around $1500, possibly more. The Carol, on average sells for around half that amount. Most players look to pocket trumpets as a second (or third) trumpet – a backup, a travel horn, a novelty for gigs, etc. 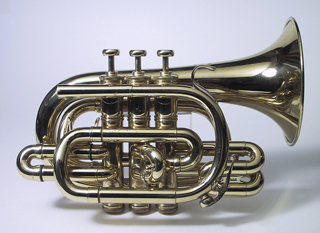 As a result, price has a great deal to do with the purchase – much more so, than if the trumpet was intended as the primary player instrument. This makes the Carol a very attractive choice at around 1/2 the cost of a Benge. One could make the case that Benge is better from the resale point of view, especially if one purchases an LA-era horn – at current selling prices, they will probably never lose value. However, my observations indicate that UMI –made Benge pockets can lose 1/3 of their value upon resale; $500 or more. The Carol’s low purchase price means that even if the horn loses half its value used, the depreciation is minimal. I would think it quite easy to resell a used Carol once the prospective buyer had a chance to play it. Pro-level Taiwanese horns continue to improve in quality, and the Carol Brass Pocket Trumpet is proof of this. It’s clear to me and many others that, while small quantity or specialty instruments will continue to be made in the US, mass market instruments will soon be manufactured almost exclusively in Asia.